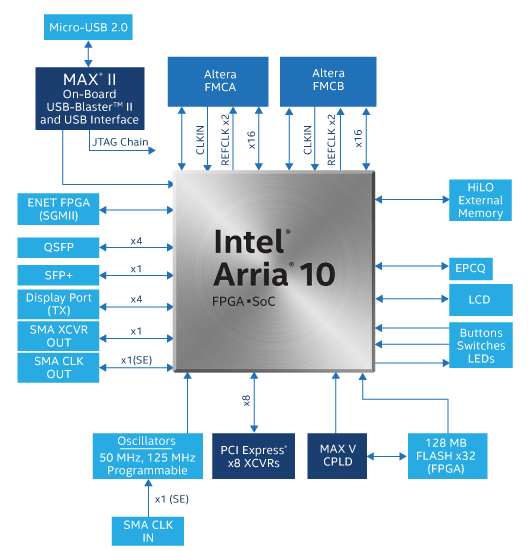 The Intel® Arria® 10 GX FPGA Development Kit delivers a complete design environment that includes all hardware and software you need to start taking advantage of the performance and capabilities available in Arria 10 GX FPGAs for your design needs. Develop and test PCI Express* (PCIe*) 3.0 designs using the PCI-SIG*-compliant development board. Develop modular and scalable designs by using the FPGA mezzanine card (FMC) connectors to interface to a FMC mezzanine card provided by Intel partners and supporting protocols, such as JESD204B, Hybrid Memory Cube, Bandwidth Engine 2, Serial RapidIO*, 10 Gbps Ethernet (10GbE), SONET, Common Public Radio Interface (CPRI), OBSAI, and many others.